I’d like to hear more from Stout on what should be done to incorporate prosocial needs into corporate governance. Don’t tell me self-selecting directors are blessed with a divine right to rule. Bartley J. Madden has been thinking about these issues for some time. 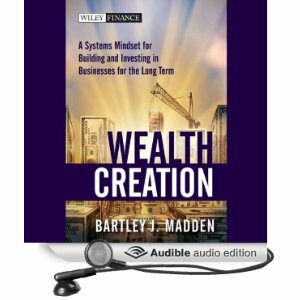 He recently released Wealth Creation: A Systems Mindset for Building and Investing in Businesses for the Long Term at Audible and more recently Management’s Core Responsibilities at SSRN. See also the News and Publications page at LearningWhatWorks.com. In Management’s Core Responsibilities, Madden argues that rather than focusing on maximizing shareholder versus stakeholder values, it is more productive to avoid the language entanglements. Instead, he focuses on common ground concerning management’s core responsibilities. Make the world a better place. We don’t live to eat; neither should we work just to make profit. Improve value stream efficiency. Any one decision by a firm that improves the entire value-stream efficiency is worthwhile even if the benefit goes solely to its end customers and/or suppliers. Reward long term shareholders through disciplined innovation attuned to the life-cycle financial variables that ultimately drive value (limitations of EVA are explained in a detailed Endnote). Pay for value created. Requires employees equipped to develop knowledge-base solutions, pushing decision rights down to those demonstrating the necessary skills, gain-sharing with value creators, and a culture of experimentation and fast learning. The great and terrible irony of modern business is that so many managers feel overburdened with responsibility, while so many employees fee unchallenged and unfulfilled in their jobs. Madden argues convincingly for a more balanced approach. If I’ve piqued your curiosity, there’s much more from this prolific thinker and practitioner at LearningWhatWorks.com.